Green anole lizard (Anolis carolinensis), by Gregg Thomas. 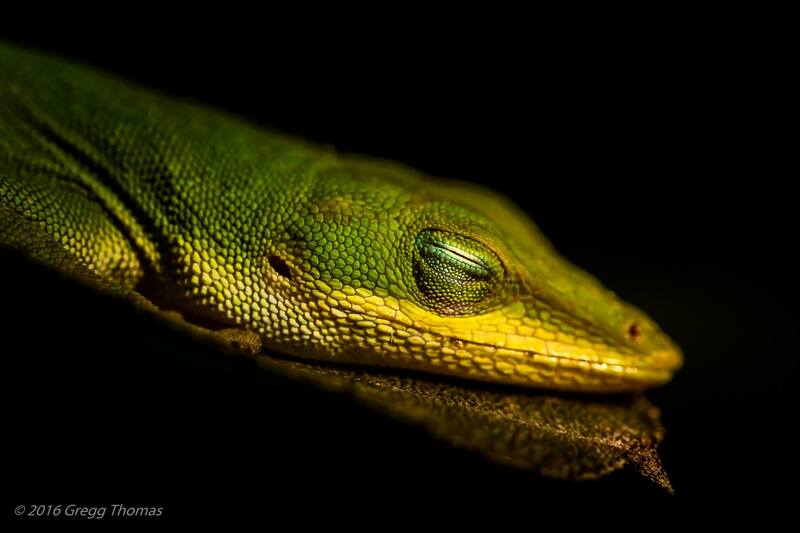 This anole was asleep at around 9 p.m. at night, laying perfectly still on a long, green slender leaf with his eyes closed. The shot was taken with a macro lens to allow for a lot of depth and detail, and a diffused off camera flash was used to give perspective lighting and also to enhance the detail. Manual settings: F9, ISO 800, 1/30sec, 105mm macro lens, off camera flash. Anoles are sometimes called chameleons since these lizards change color back and forth from green to brown. Color changes can be a result of temperature, background color of vegetation, or mood. Anoles eat small insects whole, and are usually seen within and around vegetation, to include the vertical walls of our houses! When male anoles are defending their territory or trying to attract females, they open and close their large, red dewlap just under their chin. This is often seen while the male bobs up and down, as if he is doing push-ups. Green anoles are fantastic to have around your gardens, as they provide earth friendly insect eating services year round! Such a great photo and the lizard is really beautiful. Fantastic photo! Sounds like a really cool creature.